Hi! I’m June –minimalist mama to four adorable and rambunctious kiddos. I’m so glad you found This Simple Balance! First off, I want to let you know my take on minimalism, since much of what I share here centers around minimalism. For some, minimalism is a trend. For others, it’s a religion (no thanks. I’ve already got one of those). For many, it’s [unfortunately] a status symbol. So why minimalism, especially if you live on a lower income and have kids? I mean, is minimalism even helpful or possible in those circumstances?! Here’s the thing about minimalism: it’s a tool, plain and simple. It’s a means to an end. Minimalism gives me back one of the most limited resources we have (especially moms): time. When you own less, you spend less time cleaning, organizing, and maintaining your house and your stuff. You can do more. My “more” was homeschooling my kids and starting my own business to earn extra income for our family. Your more might be different than mine. It might be spending more time with your kids. It might be saving money by making more food from scratch and at home. It might be pursuing a hobby you never had time for. It might be volunteering, starting your own business, having people over more often. Whatever your “more” is, owning less will help you get there. I created a jumpstart Declutter Your Home Checklist with over 100 items that anyone on any income can use to get started decluttering. This is the easy stuff – things that really need to be thrown away or given away ASAP. Subscribe to get my regular e-mails to grab your checklist for easy reference! Who is This Simple Balance for? I started This Simple Balance to teach other moms how to find more margin in their lives. I write about minimalism & simple living, relaxed homeschooling, and positive parenting. If you are interested in any of those topics, there is a place for you here! Grab the freebies you’re interested in, and I’ll keep you in the loop about the topics that interest you (i.e. if you don’t homeschool or aren’t interested in homeschooling, I won’t spam your inbox with homeschool related encouragement and info). Even if you dont want the freebie, subscribing will make sure you get my regular e-mails with exclusive content and tips just for subscribers! Find all about the second freebie for parenting the little years in this post. Are you a new parent struggling to implement positive parenting? These simple phrases can help! Free printable with all 8 phrases for easy reference to memorize and start using right away. BONUS: Get access to my regular e-mails! This definition makes so much room for every minimalist to be different. We are different people, so what we most value, and what distracts us from it, will look different for all of us. There is freedom to be different, even if Instagram and Pinterest say differently. You can actually be a minimalist who LOVES color. You can have things on your walls and toys in your living room. We are all different, and variety is a good thing. Read more about my definition of minimalist in this post. Is minimalism with kids really possible? With a lot of hard work, I learned how to do minimalism with kids in a healthy way. I came up with an approach that allowed me to navigate the complications of multiple different people with so many different “values” and “loves”, living under one [small] roof. I want to offer you that same framework: a beginning foundation that you need to make it for the long-haul as a minimalist with kids (and not have your kids hate minimalism by the time you’re finished). 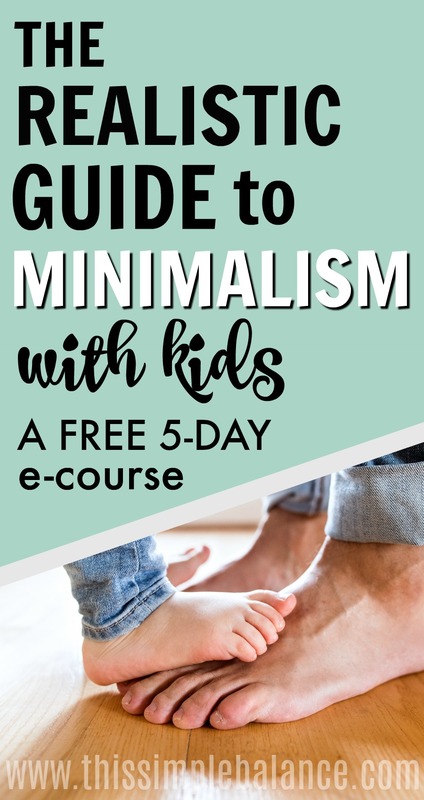 I hope it helps you to find your way forward to a balanced approach to minimalism with kids because it is possible to be a minimalist, even with kids. 1) I love Jesus. If you don’t, it’s o.k. A lot of what I share on this blog is practical tips for, as my tagline states, “owning less, and doing more”. But you should know that my friendship with Him and pursuit of Him is behind everything I do, and I often ask Him for solutions to my everyday problems and overwhelm. He sustains me on this big family journey. 2) I love coffee, except when I’m pregnant. 3) I love talking educational theory and philosophy. People who love talking about How Children Learn and rethinking how we do education are my jam. 4) I hate bugs. I scream around bees and spiders and huge ugly millipedes. I know I shouldn’t, and I’m teaching my kids to be scared of bugs, but I just. Can’t. Help it. 5) I studied Deaf Studies, American Sign Language, and Guidance Counseling in college. In fact, I have a master’s degree that I’ve never “used” and we are still paying for. I’m sure it’ll come in handy one day. 6) I am naturally a strong “J” on the Myer’s Briggs scale, but my husband is showing me the surprising benefits of being a “P”. 7) I’m a borderline introvert/extrovert, quite possibly an ambivert. The number of kids we have and my husband’s extreme introvertedness push me back and forth across the line, depending on the day. 8) I am a recovering perfectionist. You can’t tell because you often need to go from one extreme to the other to find balance. 9) I order the same coffee at Starbucks every time (a grande vanilla latte with whip, no foam). I love going to the same restaurants I already know I love and watching the same movies over and over. I pretty much avoid any new experience that could potentially waste my time, energy, or money. My husband tries to get me to branch out. 10) I sing when I’m trying not to yell. The kids all know mommy’s trying not to be angry singing voice. It usually doesn’t help that much, and it sounds pretty ridiculous if I actually stop to listen to myself.